Dominique articles, photographs, artwork and such are always of interest. I have a nice collection; however there are probably more items waiting to be discovered. Even if you aren’t interested in parting with the item, I’d like to add it to the list of known objects. Old family photographs, which contain Dominiques, are of particular interest. To-date only a handful have been found. Dominiques were already on the decline when home photography became affordable; therefore only a few seem to have been captured on film. And finally, if you encounter any Dominique item dated prior to 1825, contact us immediately. Fewer than a dozen of these truly old items are known to exist And if by chance you should find information on the Dominique club in the Boston area around 1820, you have found a historical document of great importance to this breed. As you can see the opportunity to find and share interesting and “new” information on the breed still exists. Don’t be shy, contact us about your items and we’ll be happy to discuss them. 2. A complete copy of the report from the meeting where the Standard of Excellence was created. 3. The Dominique rooster stamp from the World Poultry Congress. 5. Egg Trial reports including Dominique statistics. 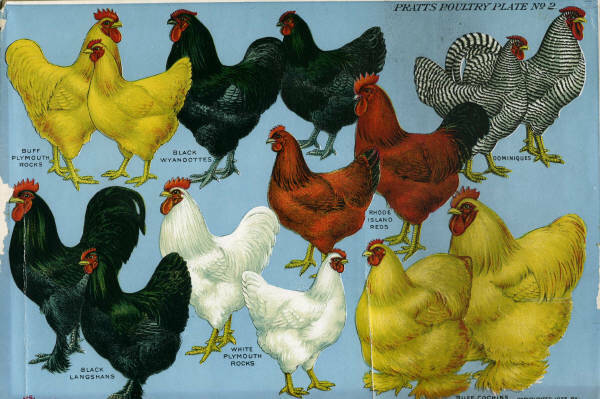 1907 “Pratts Official Poultry Chart” The various charts depicted popular breeds. 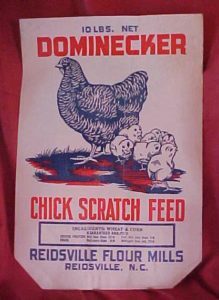 The Dominiques on this page are a poor representation of the breed, however it is an interesting picture none-the-less.